If you are anything like I am as a darts player, you probably have a thousand or so tiny holes in your wall by your dartboard. The real trick is getting your darts in the same hole twice! 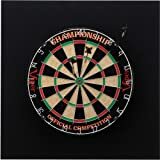 If you have hung a dartboard on a wall, the chances are that it is a wall you have accepted will be damaged at some point, especially if you have children or amateurs playing (even the best players miss the board from time to time). 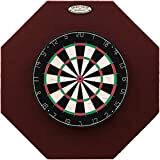 One option is to place a thin piece of wood or some cardboard behind the dartboard as a wall protector to stop the darts from piercing the wall. A more elegant solution is to invest in a dartboard backboard (also know as a dartboard surround). These boards will take the damage should you miss the board, holding the darts without damaging them. Backboards do not need to cost a lot of money, but the money you do spend will pay for itself when you compare the cost of a wall repair. Here are some of our favorite backboards, and below, we'll dive into in-depth reviews starting with the number one. If you are looking for something which can cover a large area, protecting both your wall and your darts, then you have found it. We like the plush exterior which looks excellent, no matter how many darts have been thrown into it. We like how this backboard looks, both when it is first hung and after multiple missed darts. The plush fabric holds its look, making it the perfect backboard for matching with the style of your room. A great backboard which looks neat and is suited to more professional players. There is not a lot of coverage but still enough for those who do not miss the board as much or stay close when they do miss. This is one of the best dartboard backers which we have found. The board is large, a generous 36”, and is one of the best looking boards that we have seen. The board covers the surrounding wall area in a uniform and symmetrical way. The engineered wood substrate is covered by a thick and plush fabric. This means that the wood is not damaged as much by the darts and when the darts are pulled out you do not see the holes. Spotty holes around your dartboard can look ugly and be off-putting. The fabric and wood combination also reduces the bounce outs. This means fewer darts falling to the floor and either damaging the floor or damaging your darts. The backboard is easy to attach to almost any surface, including masonry and concrete, and comes with the mounting hardware. The mounting points are reinforced so they will hold up to multiple removals and fastenings. Your dartboard is then easy to mount to the backing board. The pre-installed dartboard bracket means that your dartboard is hung at regulation height once you have the backboard on the wall. The hanging system means that your dartboard is held with exceptional stability and can still be rotated with ease when needed. The dartboard can be removed and rehung in seconds. When you have hung this backboard on the wall, and the dartboard on the board, you will notice the symmetrical hang of both boards. This board will protect your wall and look good doing it. The plush fabric finish on the thick wood means that there will be no visible holes once the darts are taken out. Wall protection is the number one priority, but that does not mean that a backboard should not look good while doing it. We like how easy this backboard is to attach to the wall. The installation hardware is included, and the reinforced holes mean that you can install and remove the board many times over without reducing the structural integrity of the board. Once the dartboard has been mounted to the backboard, it is also effortless to rotate the dartboard. If you have a removable outer ring on your board, this is a handy thing to be able to do. We love how easy this backboard is to install, and the amount of coverage that you get from it. If you are playing darts with children, then this will give you maximum coverage, especially below the board. Not only that, it will look good for many years. This backboard comes in a few pieces which are extremely easy to slot together (like a six-piece jigsaw puzzle). Once you have the pieces together, you can protect up to 8.2 square feet, making this one of the most protective backboards on the market. The compression-fit pieces also fit snugly against the wall and your dartboard for a seamless fit. No extra hardware is needed once your dartboard is on the wall. Just put the pieces together and hang this backboard around the board. The high-density foam catches and holds your darts as they are thrown against it. The rich black foam also hides the holes, as they blend on once the darts are removed. This is an excellent backboard for those who have become a little better at darts and are not missing as many shots. The board is smaller than others but does give you the option to rotate the board and better cover certain areas. This v-foam surround is easy to install and has a hanging bracket ready for you to hang your dartboard on. One thing which we like about this board, and something to think about during your installation, is the rotation of the board. You can hang it as a square or rotate it to attach the board as a diamond. This gives you options as to where the larger areas of backboard are placed. Do you notice that the same doubles are being thrown at? Rotate the backboard, so that misses on those doubles are covered. This backboard is excellent for all manner of dartboards. You can back a regular sisal dartboard or an electronic dartboard; the backboard will support dartboards of all sizes and shapes. The v-foam also looks great after many uses. The rich black helps to hide the holes in it, and you can flip the board to start again with a fresh backboard. 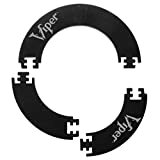 This is a compression fit backboard which means that it fits around your dartboard without needing any hardware to attach it to the wall. The backboard comes in three pieces which are easy to put together (like a large jigsaw puzzle), and the surround is then placed over the dartboard and pushed against the wall (make sure that your dartboard is the correct size for this backboard). You get five inches of protection around the entire board once you have installed the backboard. The high-density v-foam accepts the darts with ease and will hold them in place. Once you have removed the darts, the holes are barely noticeable. If you do find that the backboard is becoming worn, then you can flip it and breathe new life into the board. Will this help no matter what type of dartboard I have? If you have a sisal dartboard and use steel-tipped darts, these backboards are a must have. If you have an electronic dartboard using soft-tipped darts the backboards will still work great. However, it might not be as easy to hang the board on the backboard.